NEW! 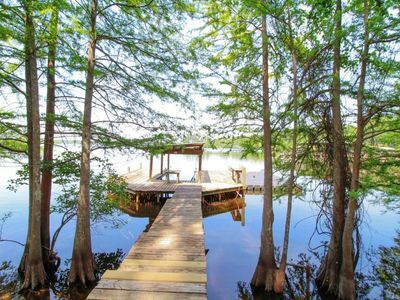 3BR Waterfront Cabin in Scenic Many, LA! 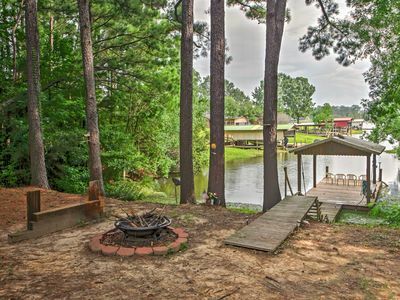 Your relaxing fishing getaway is just around the corner at this 2-bedroom, 2-bathroom vacation rental cabin located in Many, Louisiana. 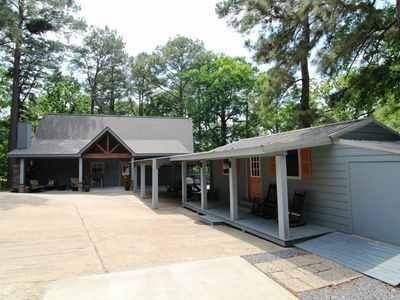 This cozy cabin sleeps up to 8 and is handicap accessible with only one story and ramps for ease. 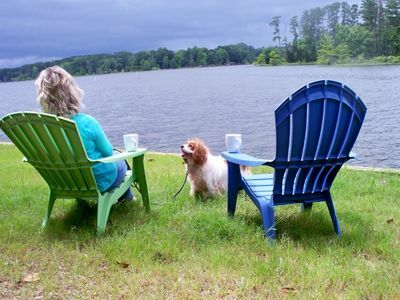 The back porch will quickly become your favorite spot to kick back and watch mesmerizing sunsets over shimmering Toledo Bend Lake. Head down to the private pier for fishing or swimming, day or night, with the convenience of the outdoor lights! 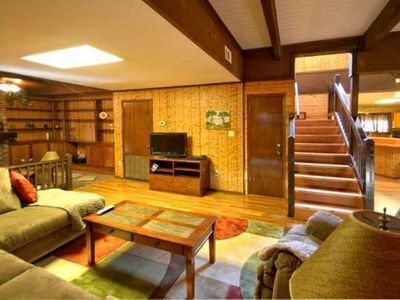 Situated in the beautiful woods of the Sabine National Forest, this quaint cabin is handicap accessible, making it perfect for families in need of some ease and comfort when traveling. When you walk inside this charming abode, the earthy wood and rustic decor will immediately make you feel welcomed. 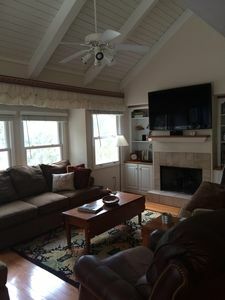 The living area has plush couches and a cable TV with a built-in DVD player for a movie night. 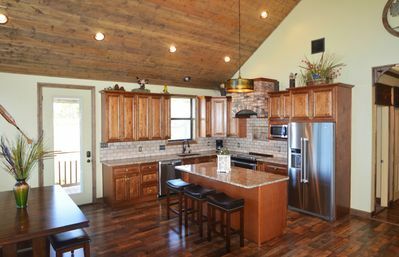 The rustic, well-equipped kitchen is ideal for making a meal with all of the amenities of home. Dine at the inviting wooden, table with seating for 4 to sit around and share stories from the day's adventures. Head to one of the cozy bedrooms and dive under the covers on the plush beds to be lulled to sleep by the quiet forest sounds surrounding this private property. 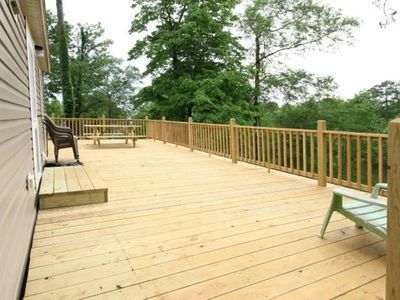 The back porch will quickly become your favorite feature of this vacation rental. With outdoor seating, the porch is the prime spot to watch dreamy sunrises or sunsets over the lake. 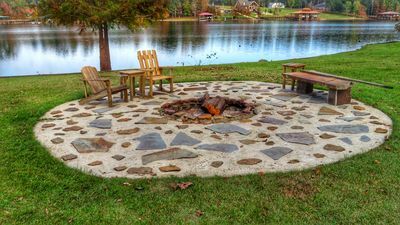 Head down from the porch to the fire pit and private pier with outdoor lighting for swimming or fishing at all times of the day. Once you have caught bountiful fish, head to the cleaning station located on the side of the pier to get your catches ready for dinner!. 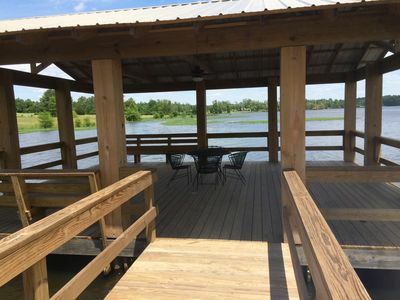 Right out the back door of this cabin is the private pier offering ample lakeside activities, including fishing, swimming, sunbathing and more! If you're looking for a convenient and delicious breakfast, head 10 miles up the road to Curtis Grocery and Diner, where you can even stick around for lunch and dinner. For sandwiches, burgers and hot dogs, stop by 191 Quick Stop, which is the closest convenience store to the property. On Friday and Saturday mornings, be sure to head down to Big Bass Marina to try their delicious breakfast! 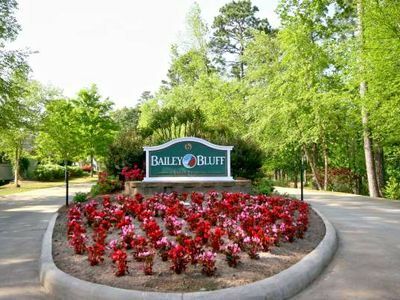 Just 18 miles up the road is Cypress Bend Resort which offers a stunning 18-hole golf course with scenic views of the lake. 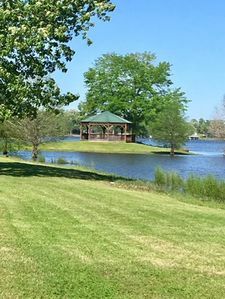 Across the street is Cypress Bend Park, which has a sandy beach that you can use for $2 per day, a boat launch, an RV park and some of the biggest bass tournaments in the area! Boat rentals are available at Turtle Beach, so you'll have plenty of opportunities to get out on the water! Here, you can also ask about fishing guides and tours. 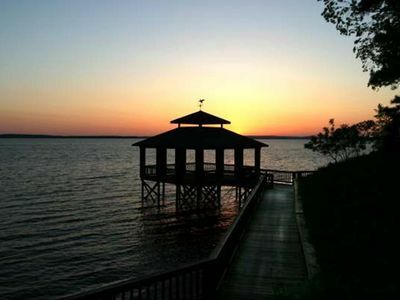 Toledo Bend Reservoir is a must-see, as it has an area of 185,000 acres, making it the largest man-made body of water in the South, and the 5th largest in the United States. Here, you can also see the Toledo Dam and watch as it works! If you're a bass fisherman, you'll surely enjoy partaking in one of the many bass fishing tournaments that take place on Toledo Bend Reservoir throughout the year! Toledo South State Park is only 20 miles south of the property and is a lakeside oasis that is also a nesting ground for the majestic bald eagle. For more scenic views, visit Toledo North State Park, just 30 miles north of the property - both state parks offer swimming pools! For shopping and restaurants, head to the town of Toledo, just 20 miles north of the property. Here, the fishers of the group can visit Toledo Town Bait & Tackle, which is the largest fishing gear/license store in the area. 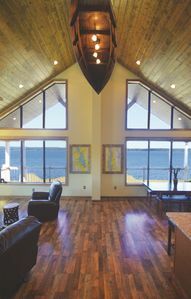 -Amenities include a handicap-accessible ramp and single floor layout, a cable TV with DVD player, well-equipped kitchen, radio, furnished back porch, outdoor fire pit, private pier with outdoor lighting, fish cleaning station, BBQ pit, laundry room, heating, A/C window units, 50-amp connection for RV, and much more! 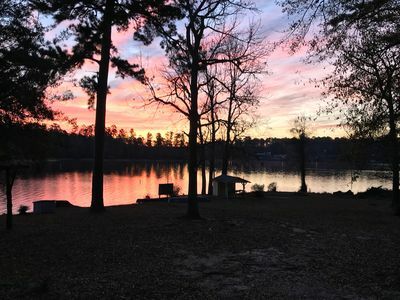 -Great Many Location- Waterfront property on Toledo Bend Lake, a short drive to Cypress Bend Resort for your fishing and boating needs, and a 20-minute drive to South Toledo Bend State Park, offering hiking, cycling, and bird watching galore! 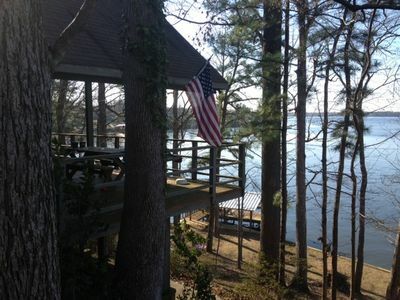 Lakefront Home with Onsite Boat Launch! Great Fishing! Very Relaxing! 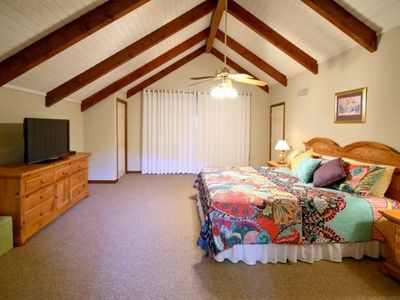 Walnut Getaway Is A Family-Friendly Home Away From Home.